• Restore, or pay more to start with? STOP! 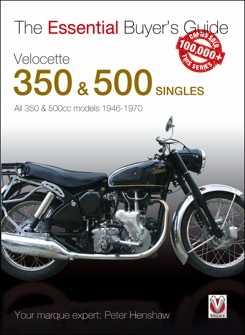 Don’t buy a Velocette 350 or 500 single without first buying this book! How to buy a secondhand Velocette single – this book covers the various models available, what to check and problem points to look out for, plus investment potential, specifications and useful contacts. This Essential Buyer’s Guide includes everything the potential Velocette buyer needs to know: how to assess the engine, transmission, frame, paintwork and chrome, tinwork, wheels and tyres, brakes, electrics, and provides an explanation of engine and frame numbers. With a detailed run down of the various models, and an assessment of which offers the best investment potential, there’s also plenty of advice on buying at auctions, essential paperwork, problems caused by lack of use, and a list of of useful contacts.